(Photo Credit: Louis Tinsley – Tom Hogan Photos/Golden Boy Promotions) By Allan Fox: Interim WBA heavyweight champion Luis “The Real King Kong” Ortiz (24-0, 21 KOs) is very confident about his fight against Tony Thompson (40-6, 27 KOs) this Saturday night at the DC Armory in Washington, DC. The articulate Thompson has done most of the talking in the run up to Saturday’s fight, but Ortiz figures he’ll have the last word when they get inside the ring. 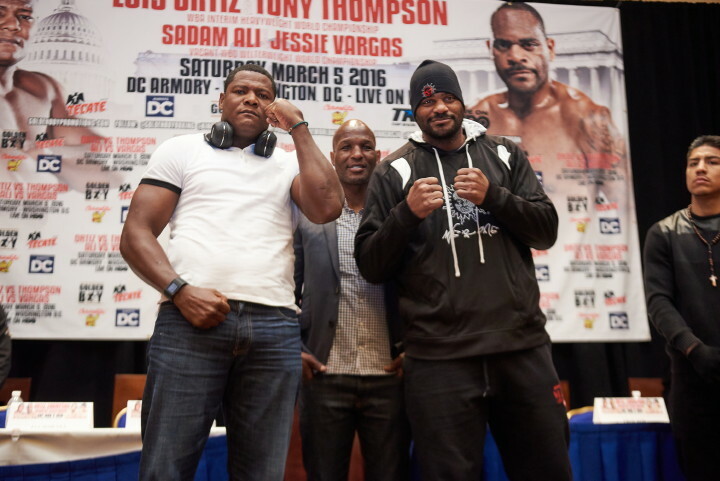 Ortiz expects to best Thompson and go back home a winner. This should be a good fight for as long as it lasts. Thompson has the size and the experience to give Ortiz his best test of his career. Ortiz is coming off of a 7th round knockout win over Bryant Jennings last December. Jennings made a lot of mistakes in that fight, and it made things a lot easier for Ortiz than should have been. Thompson, 6’5”, is an experienced heavyweight that has seen a lot of action during his pro career. He likely won’t leave himself open quite so much to the uppercuts that Ortiz likes to throw on a frequent basis. If Ortiz is going to land uppercuts against the 44-year-old Thompson, then he’s probably going to need to throw them from the outside because Thompson doesn’t crowd his opponents nearly as much as Jennings dows. Ortiz’s interim WBA title reportedly won’t be on the line for the fight due to Thompson having lost two out of his last three fights, and the fact that he’s not ranked in the WBA’s top 15. The Ortiz vs. Thompson fight will be televised on HBO Boxing After Dark on Saturday starting at 9:00 p.m. ET. Ortiz is a good heavyweight, but I don’t think he’s the most feared fighter in the division. If there was any money in fighting him, he would have a long line of challengers and champions that would want to fight him. The problem that Ortiz has is he doesn’t have a large fan base like some of the more popular heavyweights in the division like Anthony Joshua, Tyson Fury, Wladimir Klitschko and Deontay Wilder. Those are four of the more popular heavyweights in the division right now. Ortiz doesn’t stack up with any of them in terms of drawing power. He also doesn’t have the full WBA heavyweight title in his possession right now. Without the WBA full title, Ortiz is more like a highly rated contender than a champion right now. That’s even more of a reason for the other top heavyweights to ignore him. Thompson will no doubt be bringing the heat on the 6’4” Ortiz on Saturday night. Thompson isn’t the type to play it safe on the outside like Wladimir Klitschko. He knows that he’s got to go on the attack to have a chance of winning the fight. Thompson lost his last fight to Malik Scott last October in a 10 round decision loss. It was a close fight, but Thompson didn’t look that great during the action. Losing to Scott suggests that Thompson isn’t going to have much of a chance of beating Ortiz on Saturday night unless he can take him to the deep waters and drown him. Ortiz hasn’t had to go the distance in too many of his fights, so that’s one way that Thompson could beat him by wearing him down. If Thompson can set a fast pace and not give Ortiz any breaks, then he could score a late knockout. While Thompson is eight eyes older than the 36-year-old Ortiz, they both look roughly the same age. I don’t think there’s any youth advantage at all for Ortiz in this fight because Thompson has aged well.